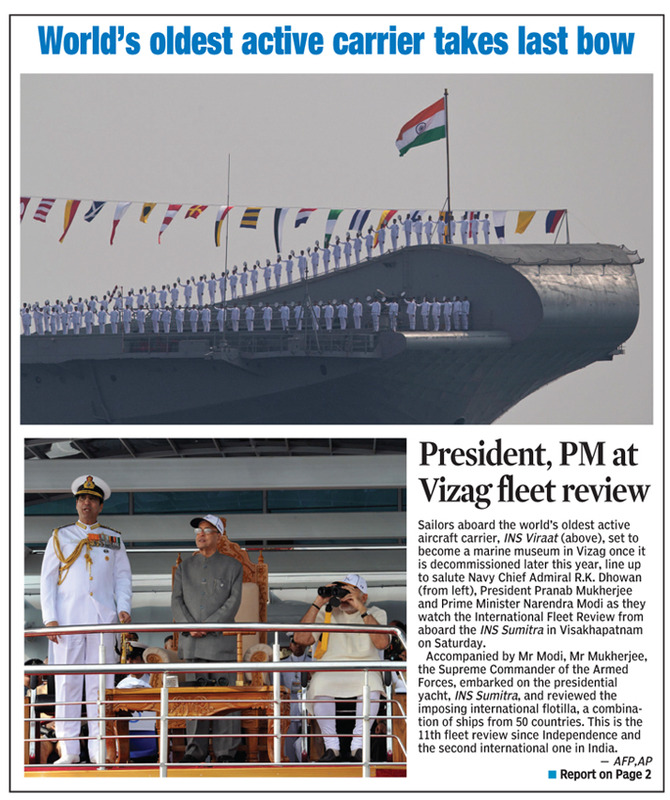 President Pranab Mukherjee today embarked on Presidential Yacht ‘INS Sumitra’ and reviewed the imposing international parade of fleet at IFR-2016 here where 50 countries across the globe have come together to participate in this show of prowess and preparedness by the Indian Navy. Mukherjee, the Supreme Commander of the Armed Forces, was accompanied by Prime Minister Narendra Modi and Defence Minister Manohar Parrikar, among others at the International Fleet Review (IFR). 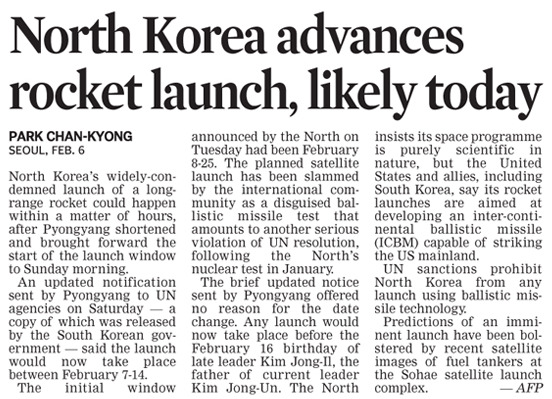 This is the 11th fleet review after Independence and the second international one being conducted in India. 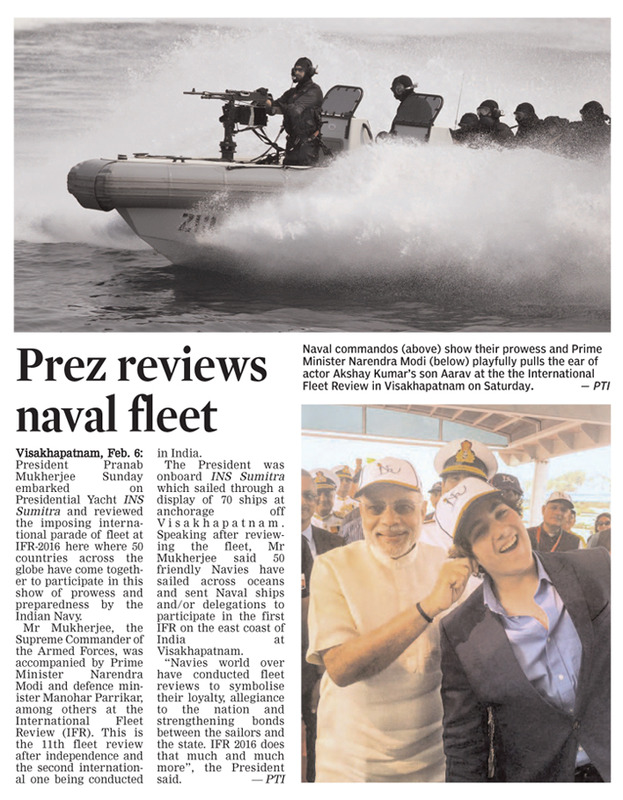 The President was onboard ‘INS Sumitra’ which sailed through a display of 70 ships at anchorage off Visakhapatnam. Speaking after reviewing the fleet, Mukherjee said 50 friendly Navies had sailed across oceans and sent Naval ships and/or delegations to participate in the first IFR on the east coast of India at Visakhapatnam. 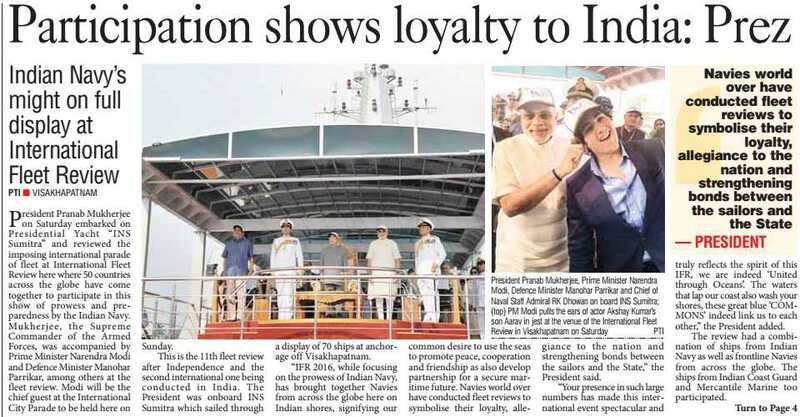 “Navies world over have conducted fleet reviews to symbolise their loyalty, allegiance to the nation and strengthening bonds between the sailors and the state. IFR 2016 does that much and much more,” the President said. “IFR 2016, while focusing on the prowess of Indian Navy, has brought together Navies from across the globe here on Indian shores, signifying our common desire to use the seas to promote peace, cooperation and friendship as also develop partnership for a secure maritime future”, he said. The review had a combination of ships from Indian Navy as well as frontline Navies from across the globe. 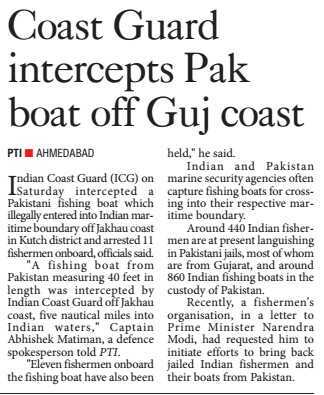 The ships from Indian Coast Guard and Mercantile Marine also participated. A former Special Police Officer-turned-militant was killed in a gunfight in south Kashmir’s Pulwama district today. The Hizb-ul-Mujahideen militant, Raqib Bashir, was killed in a brief gunfight this afternoon. Elsewhere in the Valley, a policeman decamped with the service rifle of a colleague in Srinagar. He is suspected to have joined militant ranks. Pulwama Senior Superintendent of Police Tejinder Singh said an operation was launched after receiving inputs that a militant was hiding in Gundpora village. “As a search was launched, the militant opened fire, to which our men retaliated, triggering a brief gunfight. 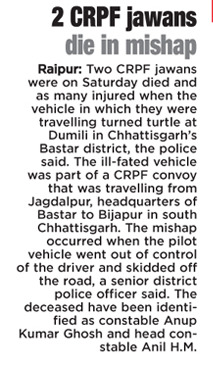 The militant was gunned down after brief exchange of fire,” he said. Tejinder Singh said the slain militant had worked as an ATM security guard before joining the police for a day in November last year. He had not decamped with a weapon. Clashes took place between residents and security forces after the killing. In Srinagar, a policeman decamped with the service rifle of a colleague. He is suspected to have joined militant ranks. The police sounded an alert after the policeman went missing this morning. Sources said police follower Riyaz Ahmed, a resident of central Kashmir’s Budgam district, fled from the Rainawari police station in Srinagar’s old city along with the rifle of constable Showkat Ahmed. They said Ahmed had been working as office boy at the police station. “After Ahmed went missing with the rifle of his colleague, we filed a case and started investigation,” said a police official. “Initial investigation hinted that Ahmed might have joined the Hizb-ul-Mujahideen,” he added. The police raided Ahmed’s house at Khan Sahib in Budgam to locate the absconding police follower, but failed to find him. A few members of his family and friends were questioned by the police. This was the second incident in Kashmir this year wherein a cop decamped with a rifle. On January 17, Shakoor Ahmed, personal security officer of the Bijbehara Deputy Superintendent of Police, decamped with four AK-47 rifles from the residence of the officer. Shakoor is believed to have joined militant ranks and is still at large. The police had later recovered two of the rifles that he had taken from Shopian in south Kashmir. A senior police officer in Srinagar said the trend of policemen escaping with rifles and joining militancy was “alarming”. Last year, police constable Naseer Pandit, who was posted as security guard to senior PDP leader and then minister Altaf Bukhari had decamped with two AK-47 rifles and joined the Hizb-ul-Mujahideen. Pandit is associated with the militant outfit and is active in south Kashmir. On November 17, 2015 Colonel Santosh Mahadik, a highly decorated para-commando of Satara, who was commanding officer of the 41 Rashtriya Riffles, died fighting militants at Manigah forest area in Kupwara district of north Kashmir. For the second time in the last four months, Satara district of Maharashtra has made the country proud after another son of soil died in the line of duty at the world highest battlefield of Siachen. Sepoy nursing assistant Suryawanshi of village Maskarwadi in Satara was among the 10 soldiers who were buried under the tonnes of snow and ice after massive avalanche hit their post at the altitude of 19,600 feet in Siachen glacier on Wednesday. Of the 10 slain soldiers buried at Siachen glacier, four were from Tamil Nadu, three from Karnataka and one each from Kerala and Andhra Pradesh. Indian Army has intensified the operation to retrieve the bodies of the soldiers buried under the mounds of snow and ice. More specialised teams and equipment have been airlifted to the glacier to augment the rescuers at the tragedy site. "The rescue operation is continuing with additional specialised equipment and teams deployed at the site of avalanche," said Colonel SD Goswami, defence spokesman at Northern Command headquarters. Indian Army said blocks of snow and ice had fallen on the post burying it very deep into the glaciated area. Heavy snow cutters and major equipment have been pressed into service to clear and cut the ice blocks. The glaciated area presents temperatures ranging from a minimum of minus 42 degrees in the night to maximum of minus 25 degrees during the day. Specialised teams are braving adverse weather and effects of rarefied atmosphere to locate the bodies. On Thursday, army declined the offer of help from Pakistani army in rescue mission on the Siachen glacier. More than 140 Pakistani soldiers were killed when an avalanche swept away their camp in Gayari sector of Siachen in 2012. Situated at the eastern tip of Ladakh, Siachen literally means the Land of Wild Roses. Famous as the highest battlefield in the world, Indian Army is holding posts at unimaginable heights across the largest non-polar glacier in the world. Indian Army has lost hundreds of soldiers to weather vagaries, including avalanches and frost bites, in the last 30 years. Pakistani army suffered humiliating defeat in 1987 when Indian Army led by Honorary Captain Bana Singh captured their "Quaid" post located at 21,153 feet which was later named "Bana" post. However, for the last 12 years, the 150 kilometer Actual Ground Position Line (AGPL) in Siachen, is witnessing calm following the border cease-fire in 2003. Before that the AGPL was a regular battlefield with both armies exchanging artillery and small arms fire to pin each other down. The death of 10 soldiers in an avalanche at Siachen has brought the spotlight back to the harsh conditions faced by troops at the world’s highest battlefield and also its strategic importance to India. Islamabad has made repeated demands for demilitarising the glacier invoking the aspect of long-term peace but India has always taken a cautious approach on the issue. 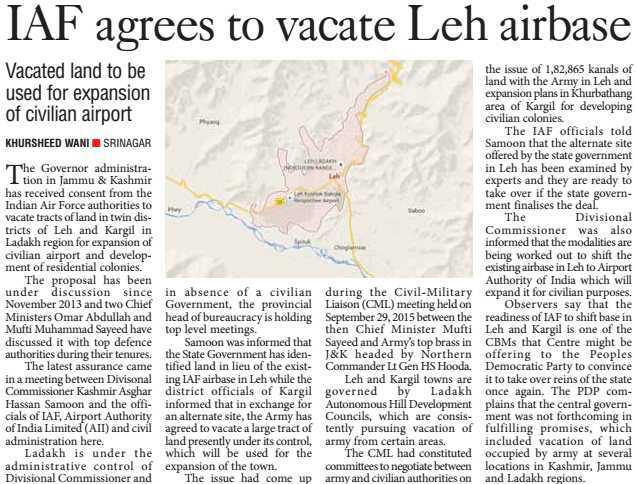 Defence officials say that as long as the glacier is under India’s control, the Pakistani army can’t link up with the Chinese and pose threat to Ladakh. 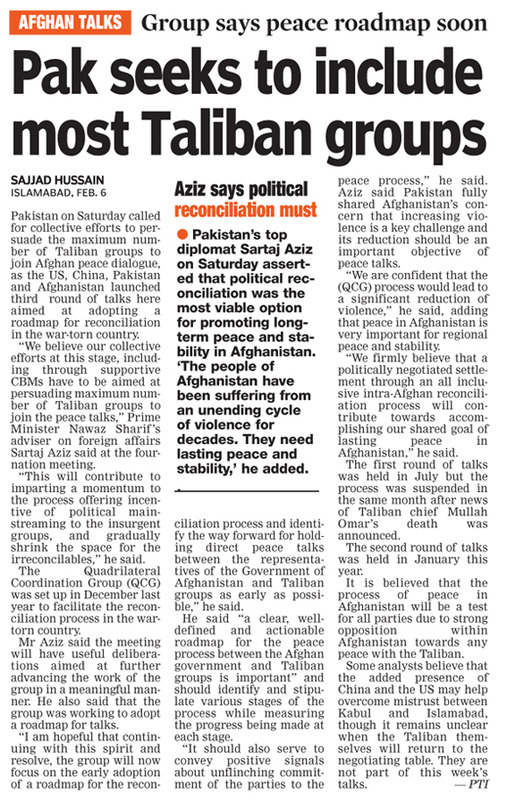 It acts as a wedge between the Shaksgam valley under China’s control and Baltistan, which is occupied by Pakistan. The Indian Army launched Operation Meghdoot in April 1984 to secure the glacier after Pakistan army occupied the heights at Siachen, a 76-km river of slow moving ice. Several rounds of talks between India and Pakistan on demilitarising the Siachen glacier --- an old sore in bilateral ties -- have failed with Islamabad refusing to authenticate troop positions on the ground. In fact, India deployed its soldiers on Siachen after Pakistan began allowing international mountaineering expeditions to the glacier, sending out a signal that it controlled the area. Different interpretations of the 1949 ceasefire agreement by the two countries also aggravated the dispute. India, which spends Rs 5 to Rs 7 crore daily on guarding the strategic glacier, has deployed around 3,000 soldiers at Siachen where temperatures can drop to minus 60 degrees. The location at 19,600 feet where the 10 soldiers died often sees temperatures plunging to minus 42 degrees. Soldiers have to trek for almost 28 days covering a stretch of 128 km to reach some of the farthest pickets on the glacier, one of the most desolate places on this planet. Almost 80% posts on the glacier are located above 16,000 feet, with Bana towering above the rest at 21,753 feet. Bana post is named after Subedar Bana Singh who was awarded the Paramvir Chakra for his helping secure the glacier in 1984. Indian Army has cautioned against withdrawing from Siachen until Islamabad authenticates troop positions on the ground as it would be a formidable task to reclaim the glacier. India currently occupies dominating positions on the Saltoro ridge with Pakistani posts located 3,000 feet below.